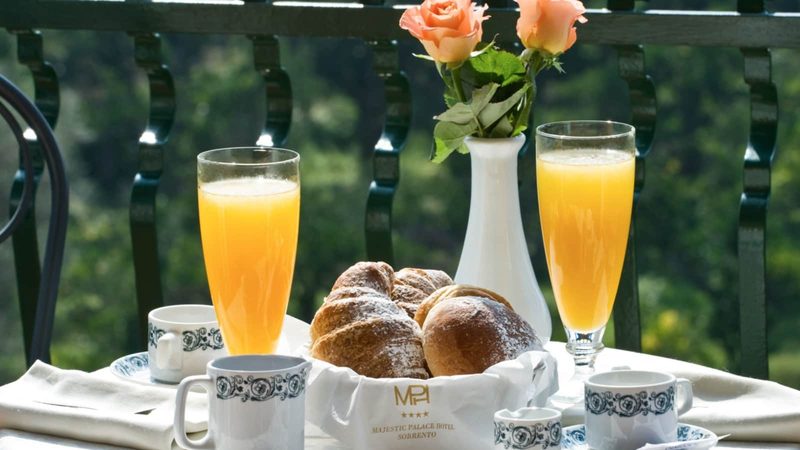 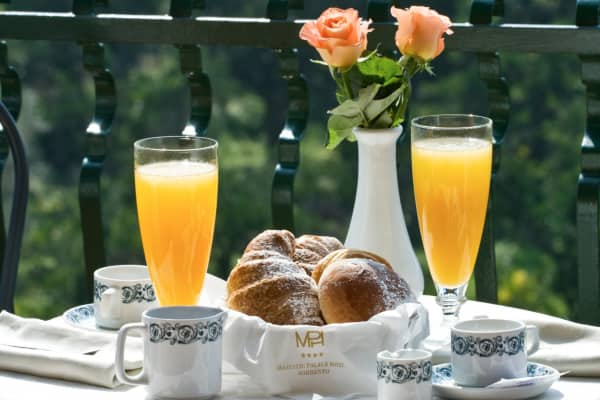 Stay in the beautiful Hotel Majestic Palace, a sophisticated oasis of tranquility surrounded by luxurious gardens and fragrant citrus trees. 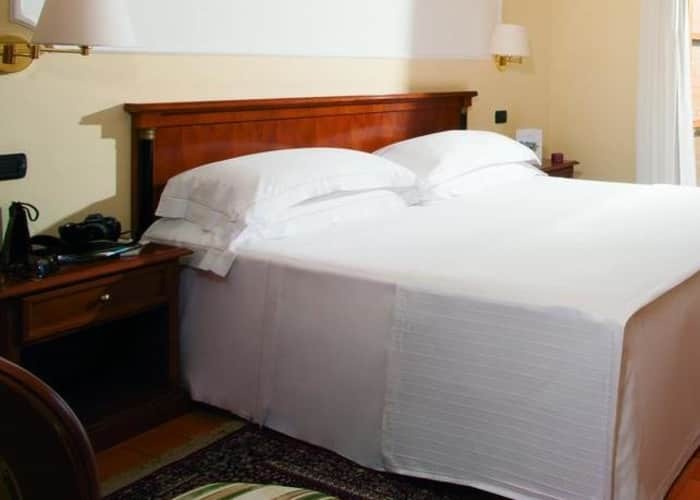 Hotel Majestic Palace is an ideal choice for those who enjoy a refuge tucked away from all the hustle and bustle of the resort centre, yet has good access to all the major attractions. 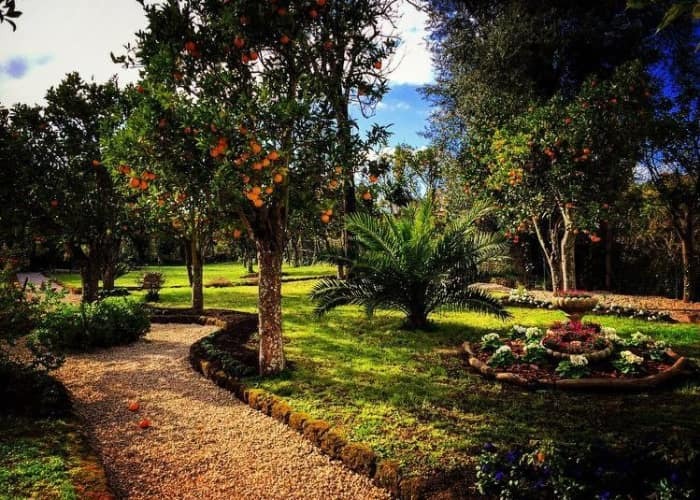 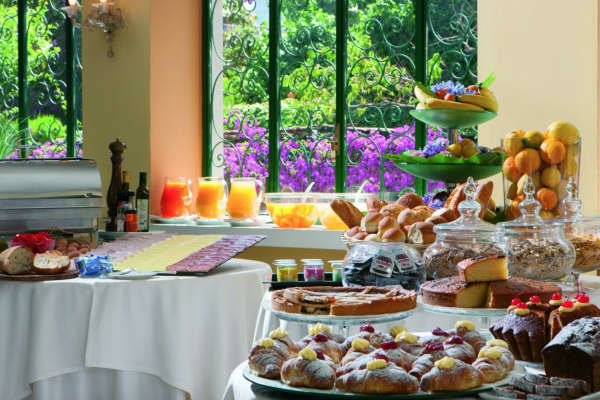 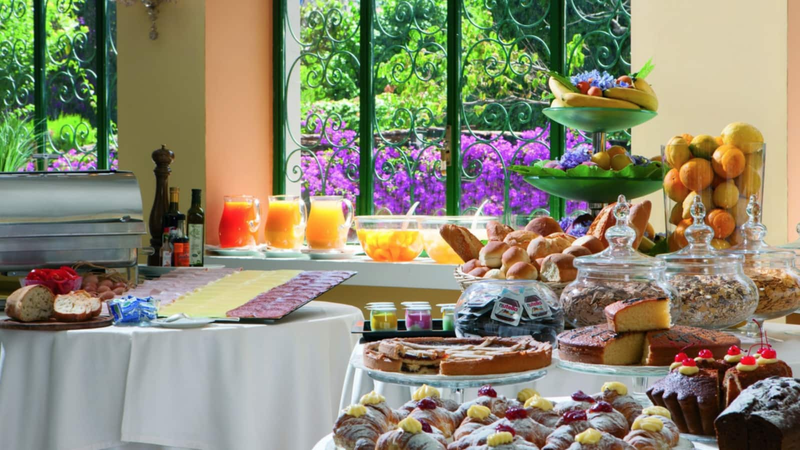 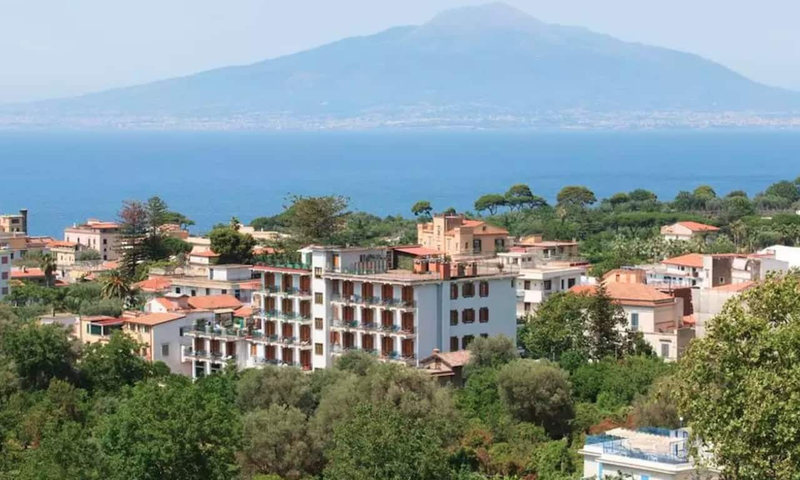 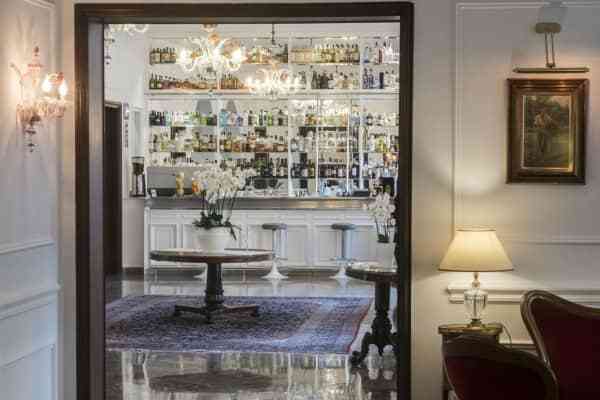 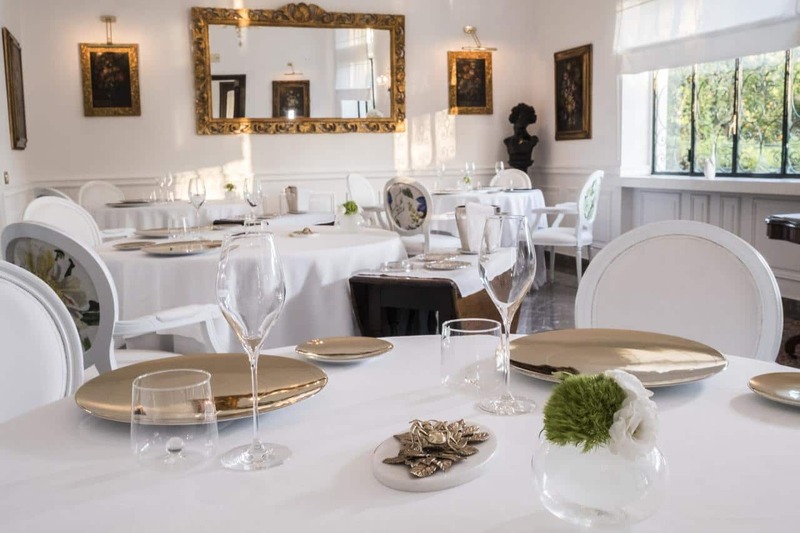 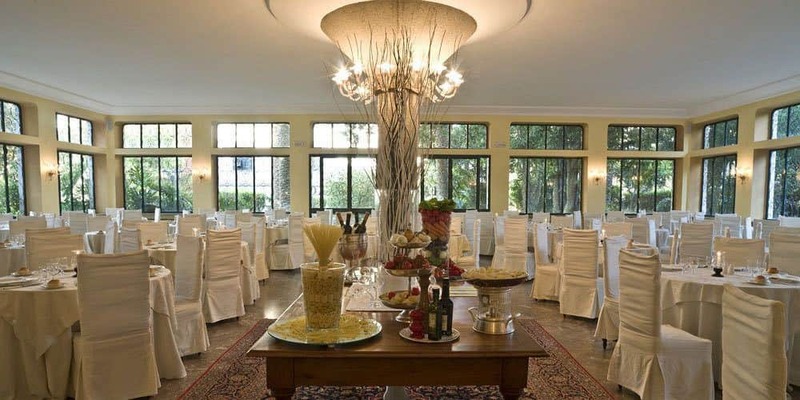 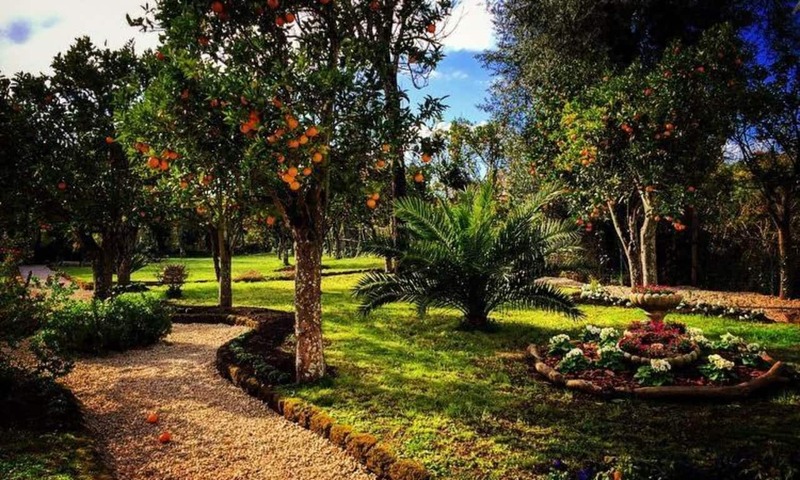 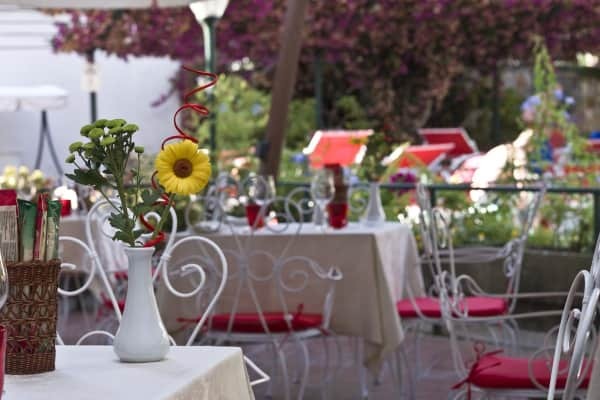 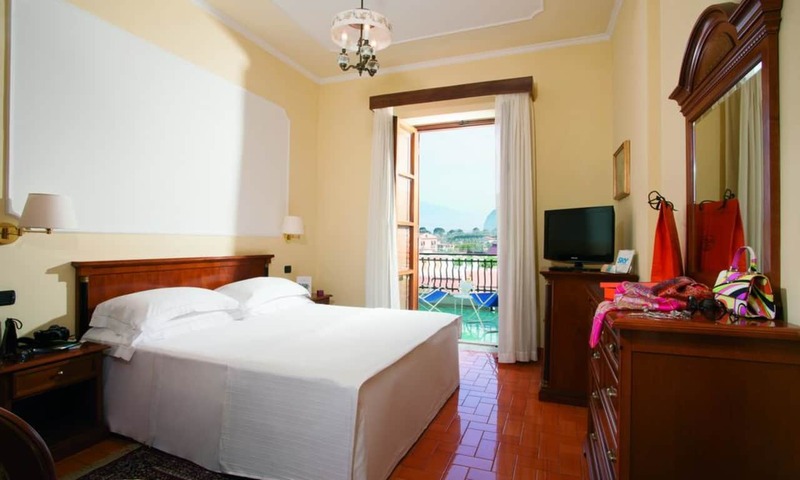 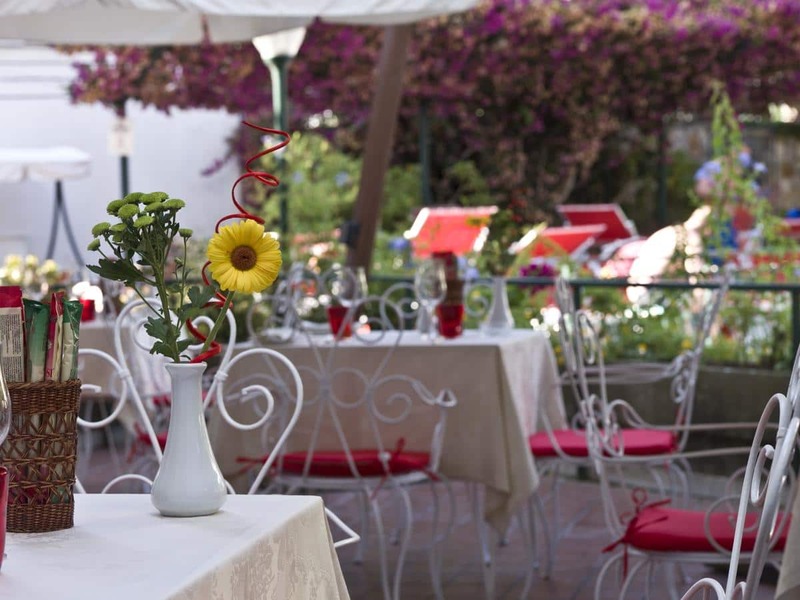 Surrounded by lush gardens and orange trees, the hotel is in the quiet village of Sant'Agnello where you can while away your days, wandering the peaceful piazzas, perusing the quaint shops and enjoying the fine fare from Sant'Agnello's various restaurants, bars and cafés. 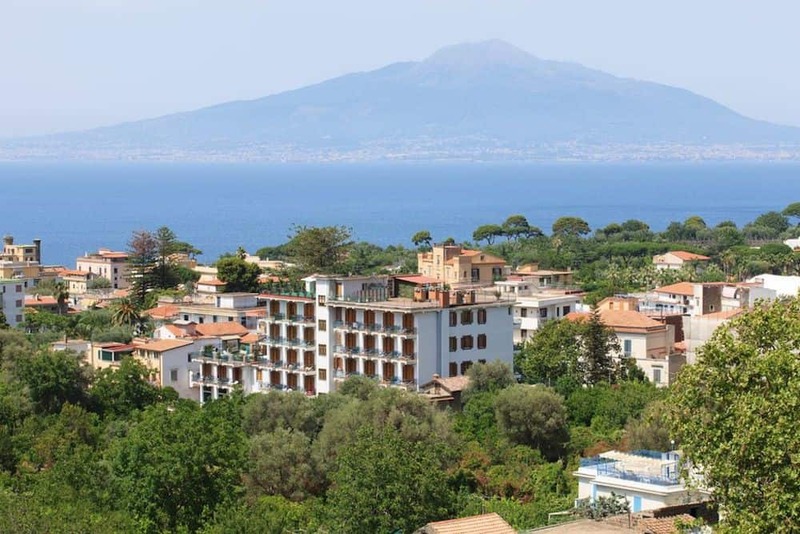 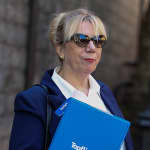 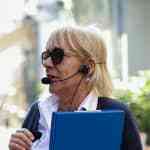 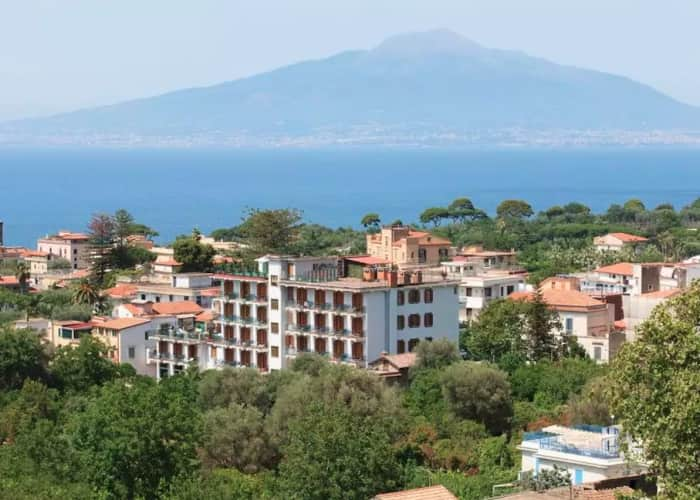 And, if you fancy venturing further, the train station is a few hundred metres away from the hotel and can easily connect you to Naples, Pompeii and Sorrento. 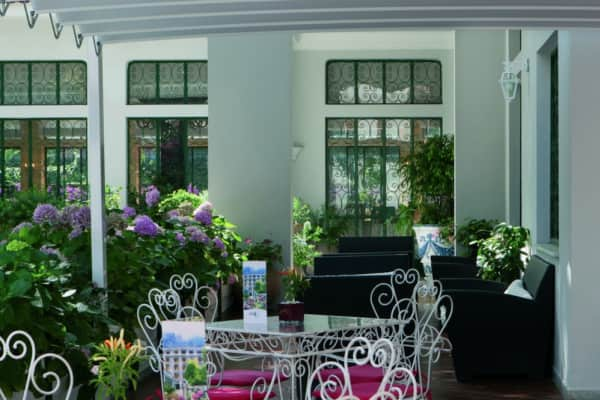 Relax in peace and quiet, by the hotel's pool, enjoying poolside snacks and sipping cocktails from the pool bar. 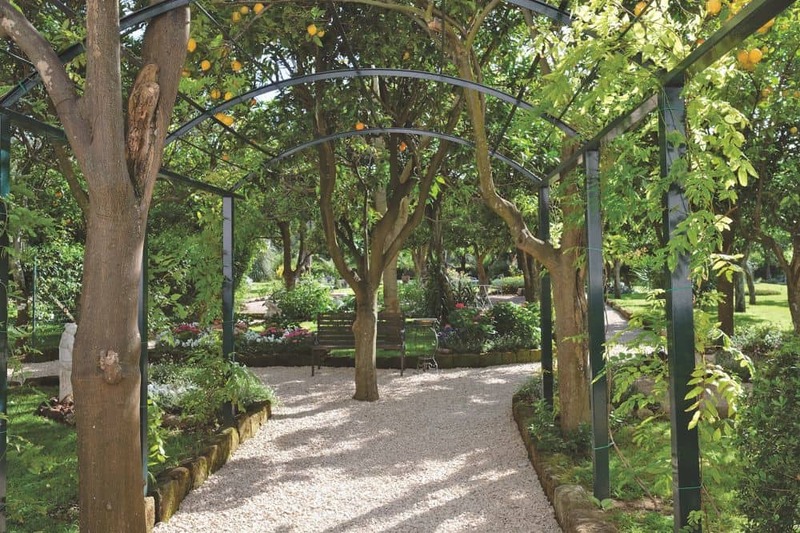 Shade is provided by the poolside trees where you simply rest and listen to nothing but the rustling of the leaves above you. 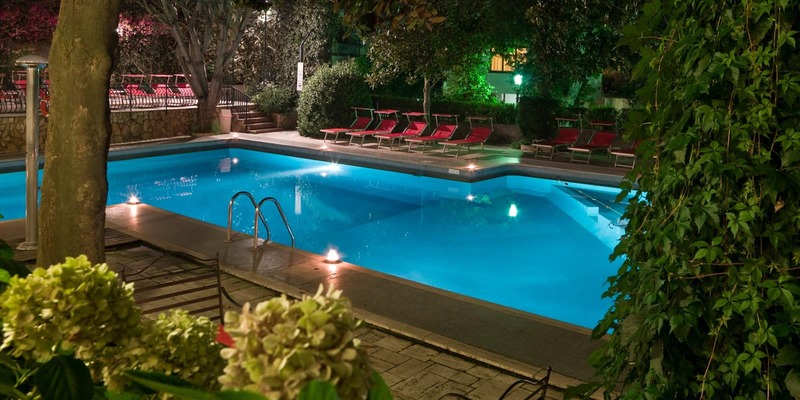 But if you prefer to lie in the sun, there is plenty of space around the pool which gets the sun all day. 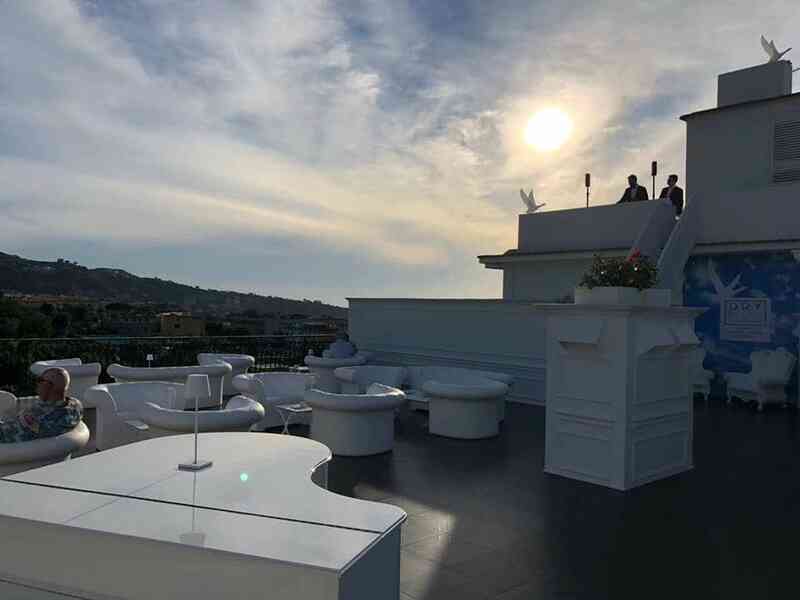 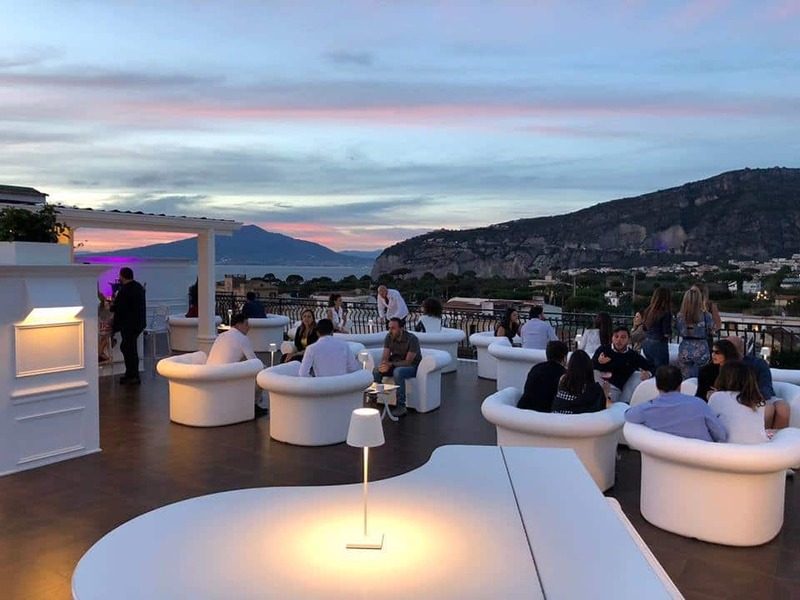 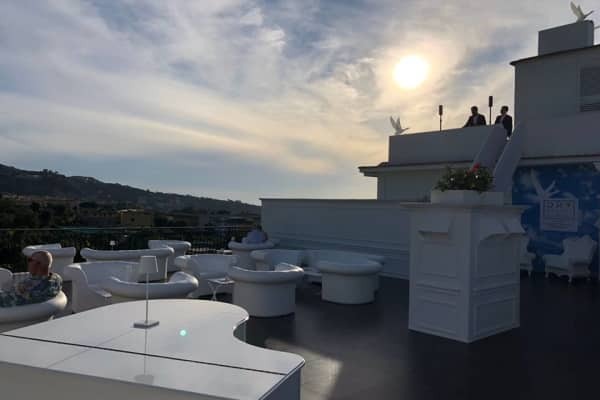 In the evenings, take to the hotel’s beautiful new rooftop Martini bar, where the panoramic terrace is home to stunning views and an absolutely perfect place to watch as the sun sets. A chic and sophisticated spot with live jazz music to be enjoyed throughout the week, relaxing here, enjoying the balmy Sorrentine evening air while sipping on a refreshing cocktail, is hard to beat. 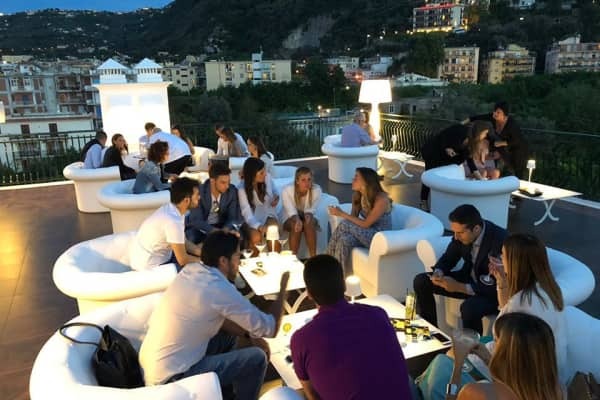 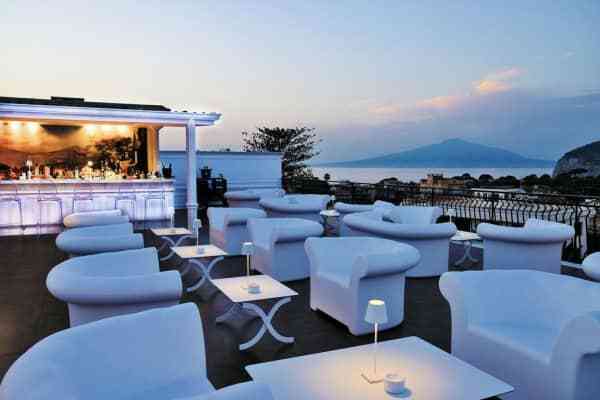 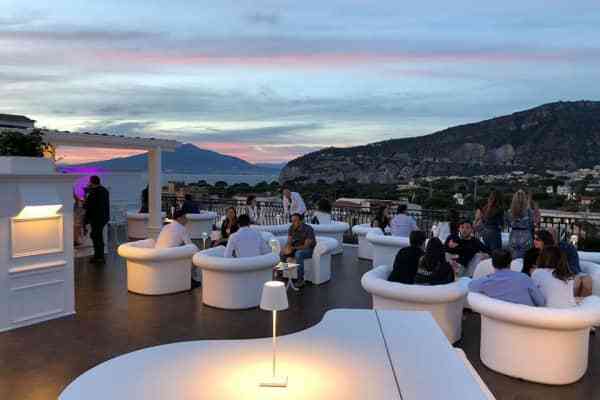 The gardens to the back of the hotel are absolutely beautiful and the brand new rooftop bar is a fabulous place to take in the views while enjoying a drink. 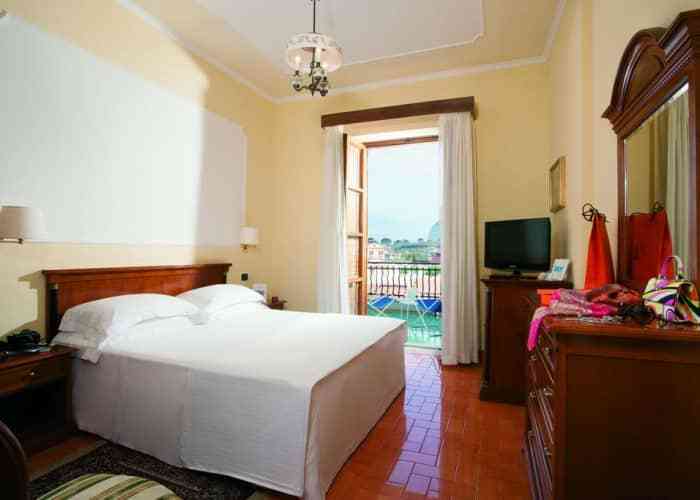 This double room is spacious and has a classic Italian feel to it, complete with beautiful wooden furnishings and fittings. 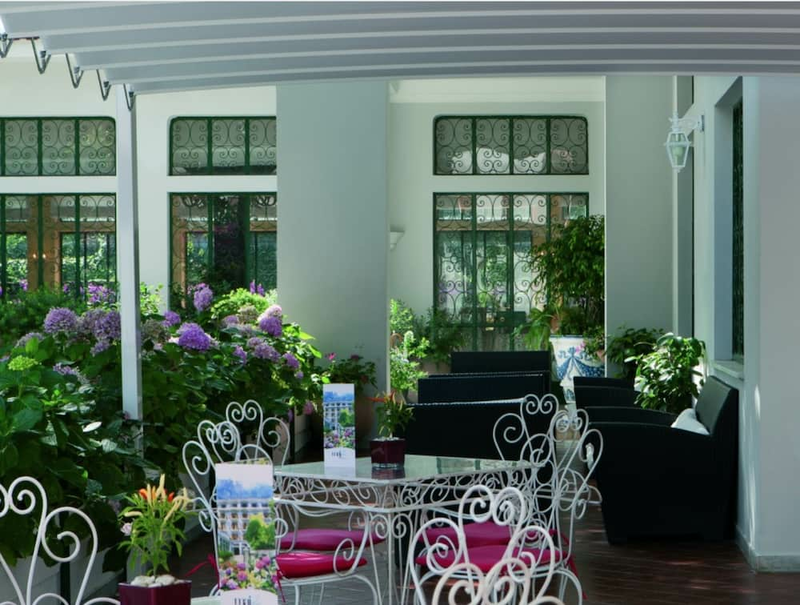 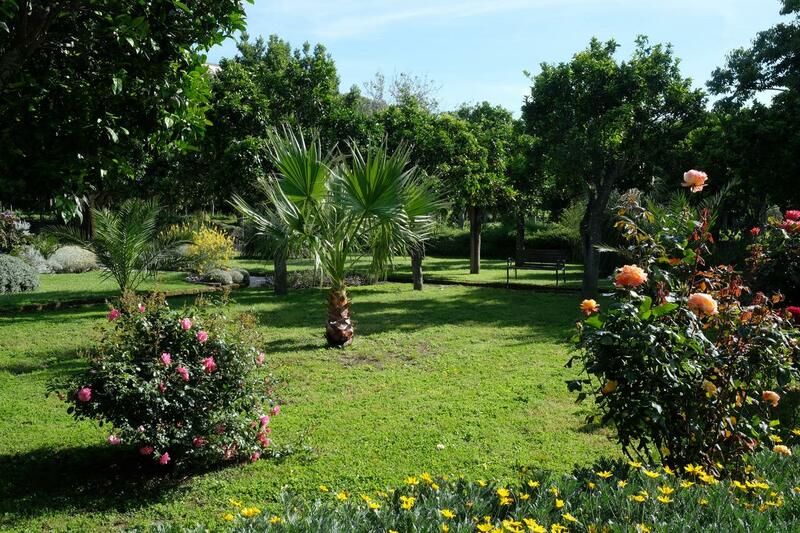 The room has access to a terrace which is overlooked by the hotel's beautiful gardens. 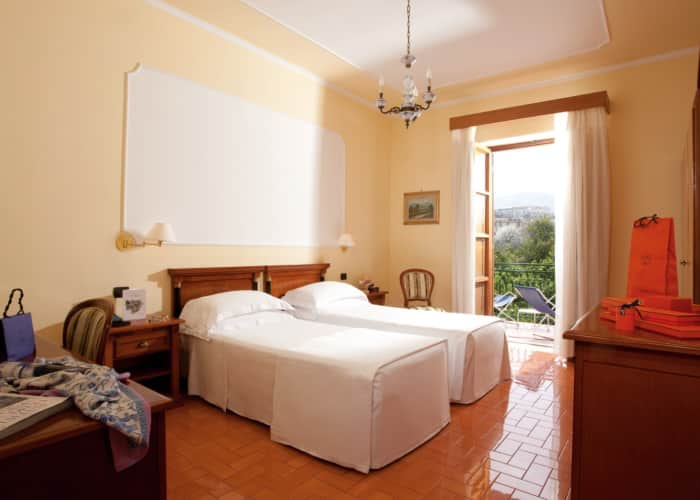 This double room is spacious and has a classic Italian feel to it, complete with beautiful wooden furnishings and fittings. 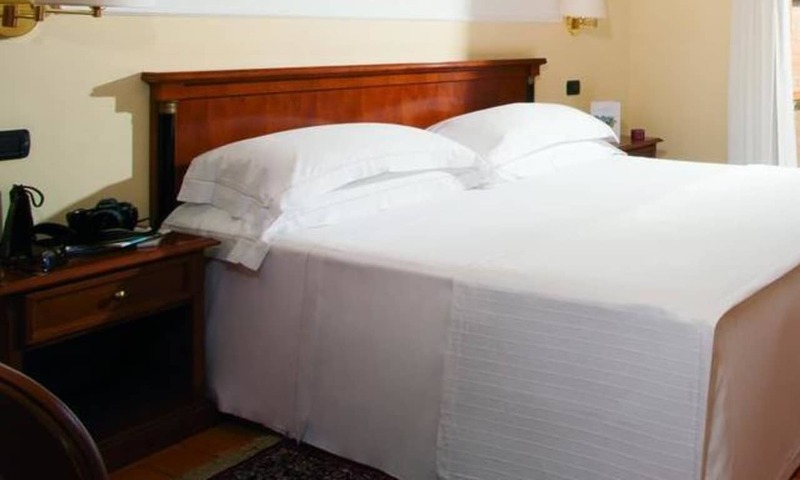 A bed can be added for a third person if required. 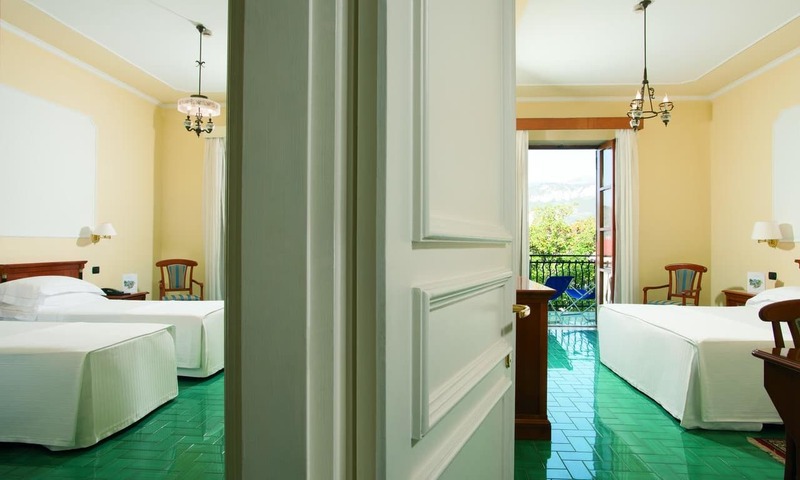 The room also has a balcony giving guests a private space to enjoy the scent of citrus fruits from the gardens and Sant'Agnello's sunshine. 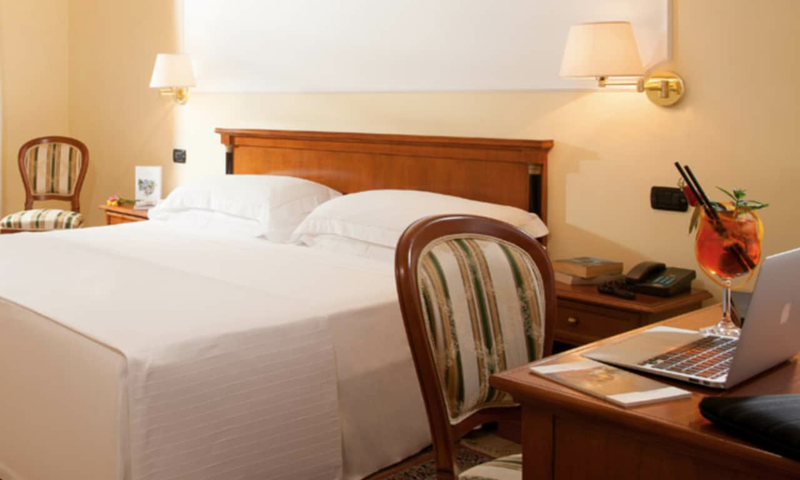 The family room features two Interconnecting rooms with double or twin beds. 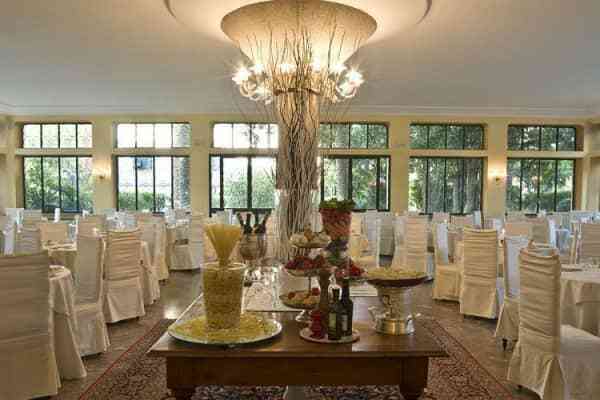 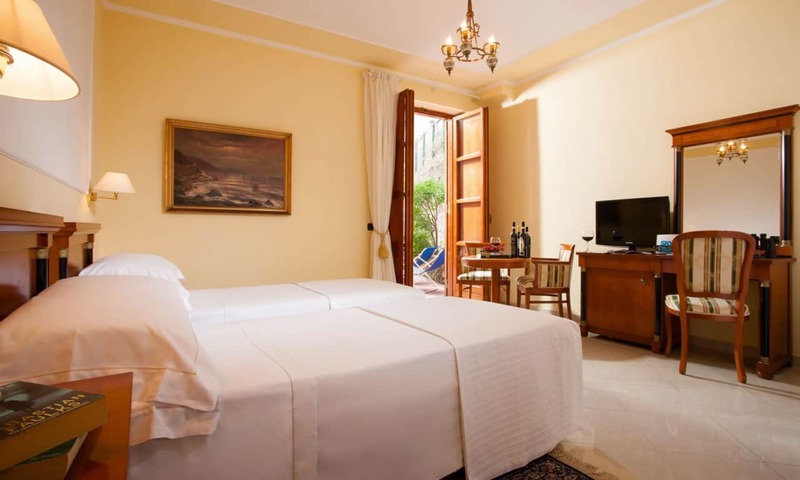 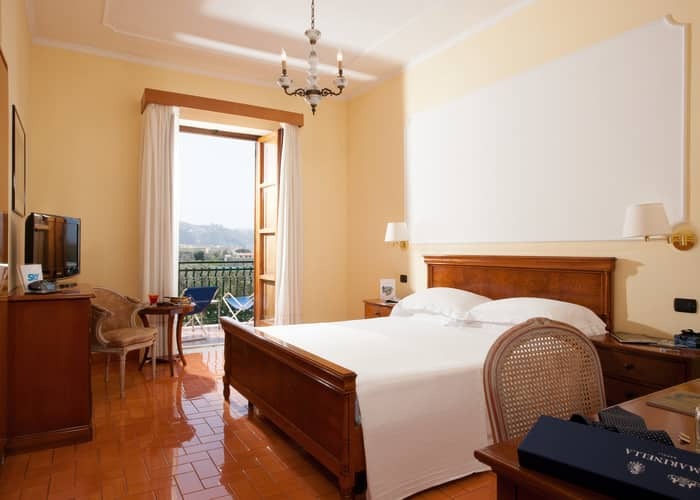 Rooms are classically decorated in an authentic Italian style, complete with beautiful wooden furnishings and fittings. 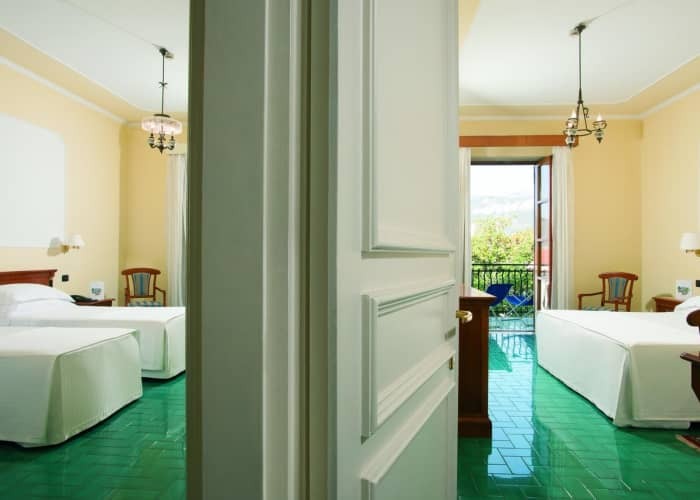 The stunning Panoramic Room is a double room on the fourth floor of the hotel. 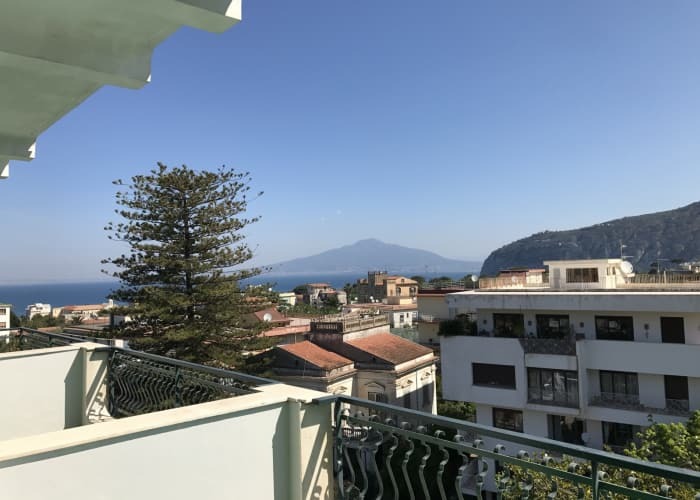 Being on the top floor means that the large balcony offers absolutely stunning views across the quaint town of Sant'Agnello, to the mountains beyond and of course the mighty Mount Vesuvius across the bay. 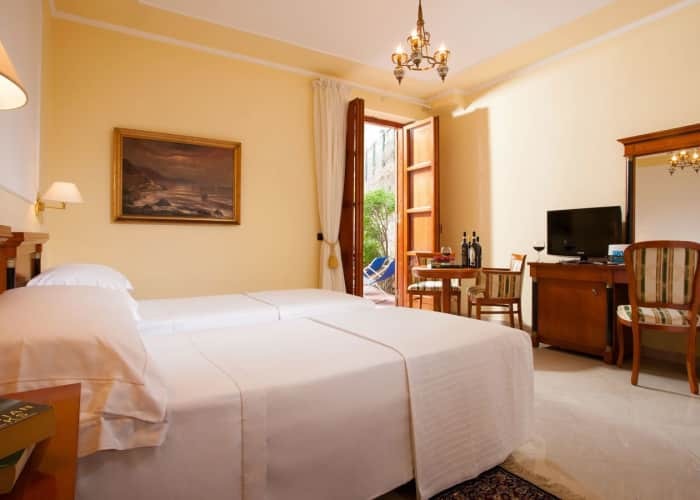 The room is spacious and comfortable and has a classic Italian feel to it, complete with beautiful wooden furnishings and fittings. 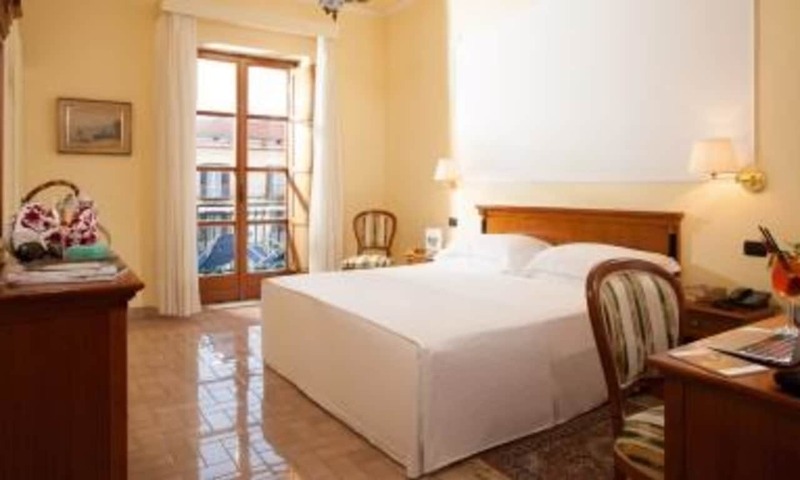 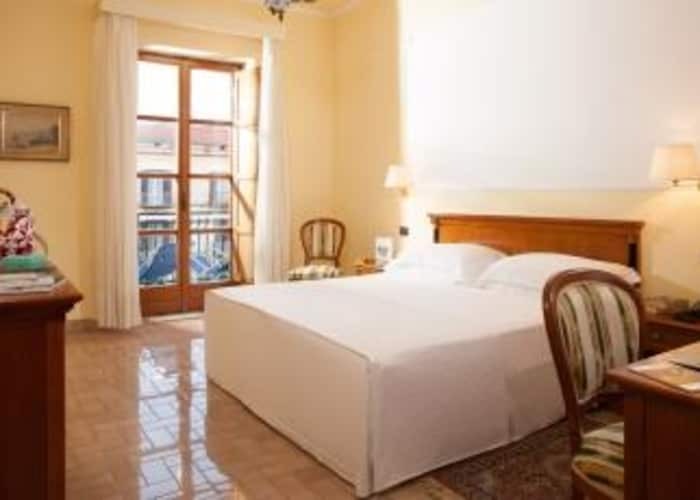 This double room has a classic Italian feel to it, complete with beautiful wooden furniture and fittings. In the lovely little village of Sant'Agnello and just 400m from the beach. 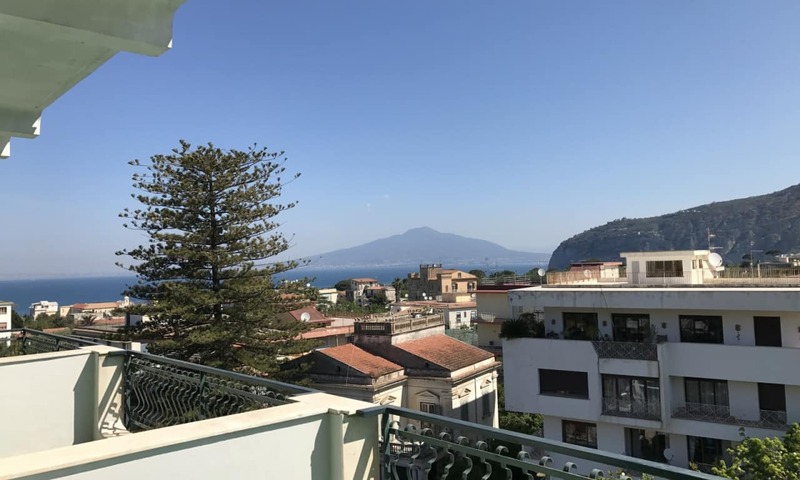 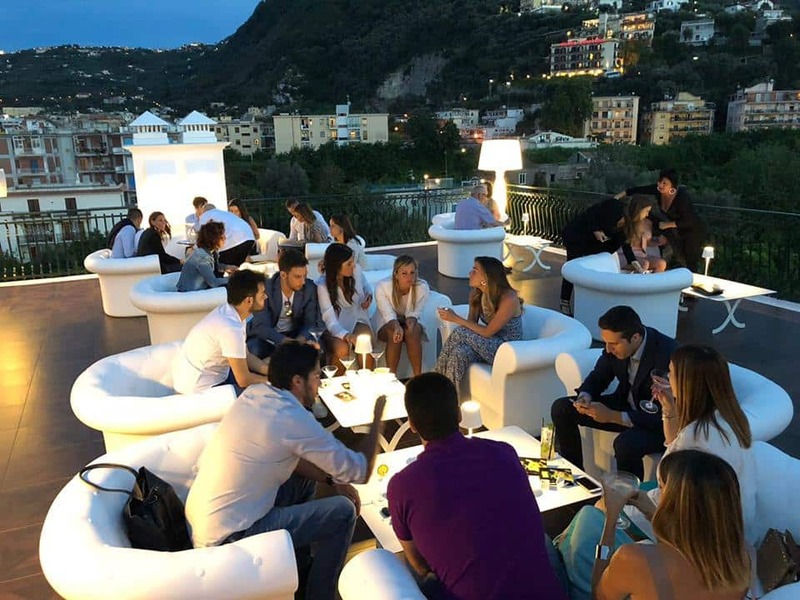 A 5 minute walk takes you to the area’s shops, bars and restaurants and a short stroll downhill will take you to a lookout terrace offering some of the most spectacular, sweeping views of the Bay of Naples that you’ll find anywhere! 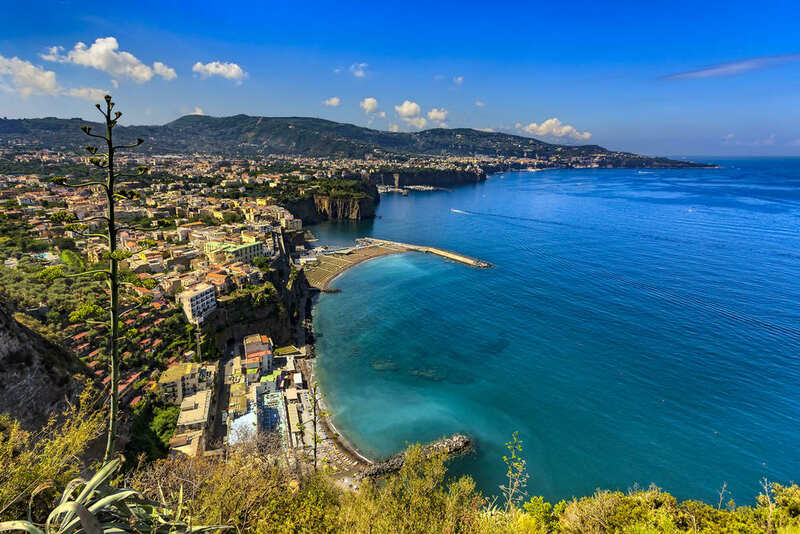 To get to Sorrento’s old town, you can take a 25 minute walk, taking in some stunning views along the way. If you'd prefer to skip the walk, you can take the train. 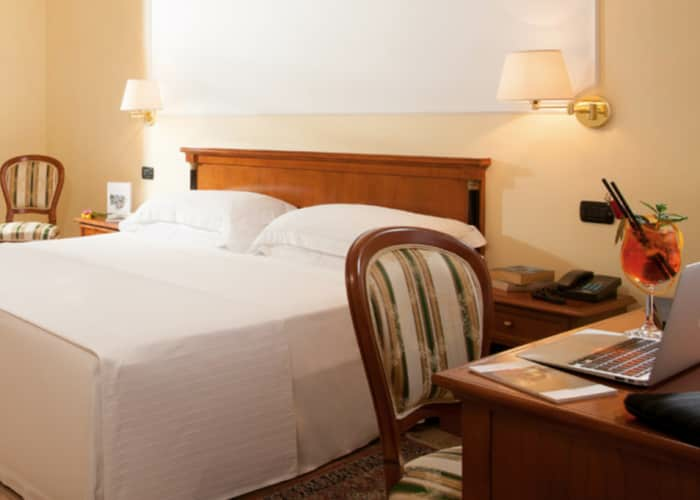 The station is just 8 minutes from the hotel, or the bus stop is just a 5 minute walk. Both train and bus will take you to Sorrento within minutes.